Cobblestone Jazz member Danuel Tate is bringing the best tunes he has done so far. Being a jazz pianist, a musician is much more important now within the electronic music arena. As the technology improves, differences between track and releases become blurred among all those similar plugins and effects. The real thing becomes the 'sound' and the idea. A classically trained musician for example has fundamental disciplines he needs to create a piece and that's why people like Danuel Tate are able to create much more with the limited ideas in their hands. Or they particularly build those ideas where most regular producer can't. In fact that is the critical point of sampling and using found footage in music. After Akufen, the term sampling have diven to micro measures and i tis a vital element of contemporary electronic music. But Danuel Tate mostly samples his instrumentation and with his skills Cobblestone Jazz is one of the most inspiration electronic band of modern times. But we are here to talk about his second solo work called "Doesn't Like You Back". I can surely say that this EP is one of the bestin Wagon Repair history. Contains very important tracks which will be played so much and are most likely ba classics. Tate's vocoder games and micro sampling attacks gives untold pleasures to the listener. His style is now cooked well. U little bit harder and edgy and it is really tough! There is even a drum&bass session called "La Boite". 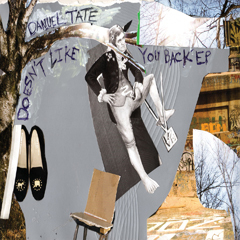 Danel Tate's 5 tracker EP is one of the best EPs of this year. And for me he is in the golden league of extra ordinary producers. Can't wait to buy this on vinyl. Ace artwork too!